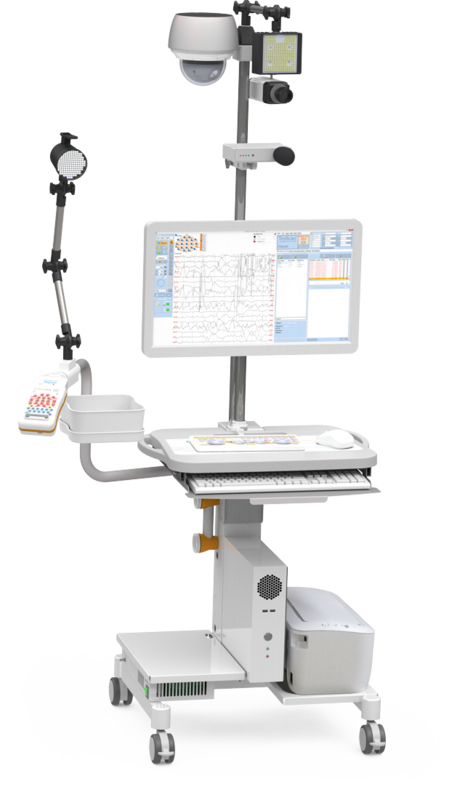 The TruScan family of EEG systems offers state of the art functionality for clinical EEG systems. The amplifier design is small and compact and runs completely on batteries. All systems have the versatility to be used in ambulatory, workstation or detached wireless scenarios. When used with a hospital cart, you can quickly detach the amplifier to go wireless and put the headbox next to the patient. The user interface is easy to learn due to the intuitive dashboard style controls. Connectivity to a hospital network including HL7 is possible as well as remote streaming of data anywhere on the network for both EEG and Video. Optional upgrades include VEP, SEP's, P300’s and HD MPEG-4 synchronized video with Picture in Picture. Wireless Use In wireless mode the amplifier can record for up to 20 hours on a singe charge. Wireless range of 100 meters from the base system for maximum patient comfort and freedom to move. 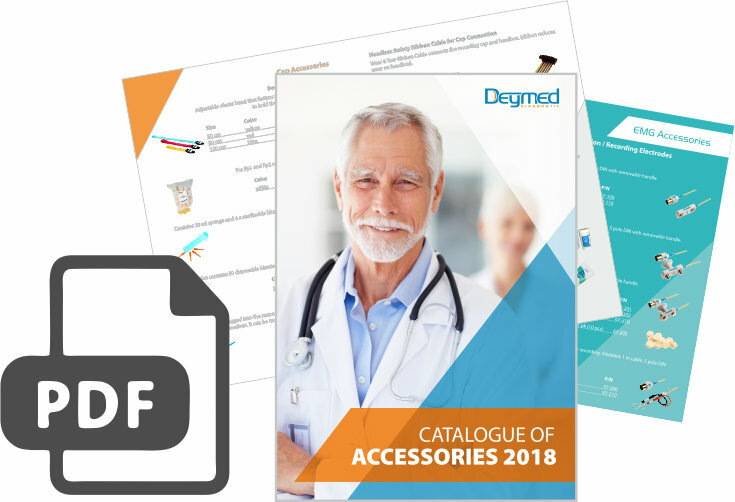 Intelligent Charging Deymed's new ultra-low capacitance induction charging keeps the batteries full when the system is not in use. This ensures the highest quality signal is possible with full battery operation during sensitive neurophysiology tests. 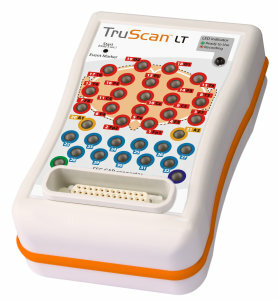 The TruScan Explorer Keyboard is a simple yet important innovation for routine EEG/Video review. The dedicated keyboard dramatically improves the speed and comfort of browsing long-term EEG recordings with video by eliminating tiresome overuse of a mouse. 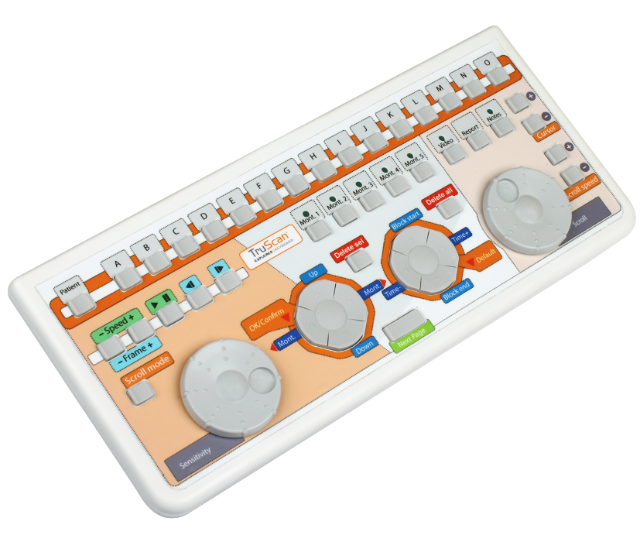 The dedicated keyboard includes all standard EEG review controls, including sensitivity, montage changes and almost all on-screen settings at the click of a button. Two large scroll-wheels allow for easy forward and back control over HD video as well as additional video speed and page advance buttons. Quick-insert text annotation shortcuts and reporting controls are also included. Full HD network video camera that already compresses the video in the camera, so no internal capture card is required, which minimizes the hardware requirements on the PC. Video can be streamed via the network to any review station or via a UDP viewer station for up to four EEG/Video stations on a single screen. High-power IR lamp that can light up the entire room with in-direct positioning, ie by pointing the lamp at the ceiling and letting the light bounce off the walls, so the light source is not visible to the patient. The HD Video Hub greatly simplifies a typically complex dual-video and audio capture, as well as integrating an microphone and ambient light sensor. combines and synchronizes video from up to two HD or SD camera sources. The hub also integrates a wide-band high-sensitivity microphone as well as an integrated ambient light sensitivity sensor for automatic night and day mode detection. The day/night sensitivity level can be adjusted in software. TruScan headboxes use state-of-the-art technology offering the highest signal quality combined with advanced options such as click-n'go wireless operation and ambulatory recording. The Click N'Go function allows universal use of the headbox in clinical, ambulatory and wireless LTM scenarios. Battery operation, intelligent charging and optical isolation ensure minimal interference. Intelligent Headbox Charger. The Intelligent charging is built into the rotating metal arm with the holder for the headbox. It charges the headbox batteries via inductive charging, ie without direct contact, which maintains the optical isolation and safety benefits of battery operation as well as allowing the headbox batteries to be charged when not in use. On the arm of the headbox holder there is a removable container basket that can be used to keep recording supplies or other needed materials for the operation of the device. If the basket is removed, there is a tray underneath that can also be used to place items on. Multiple accessory baskets can be purchased, allowing for a quick change-out, allowing pre-organized recording items to be planned out and ready each day. 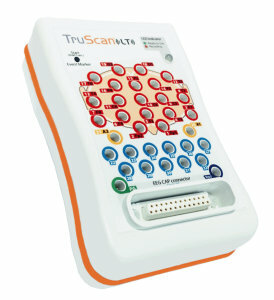 A unique innovation in the EEG field, the TruScan Explorer Keyboard was developed to speed up and streamline the review of EEG recordings with video. Ergonomically-designed buttons include all common features available on one click, minimizing the need for complex use of the mouse. The large scroll buttons significantly speed up the scrolling and ease the orientation in a long-term recording. Shortcuts are also available for fast text input and report creation controls. Ergonomic sliding PC keyboard including full Numeric keyboard for fast patient entry and report writing. Thanks to the pull-out design, the keyboard is always at hand, but it does not interfere with the exam. Optionally, a disinfectable keyboard can be supplied. 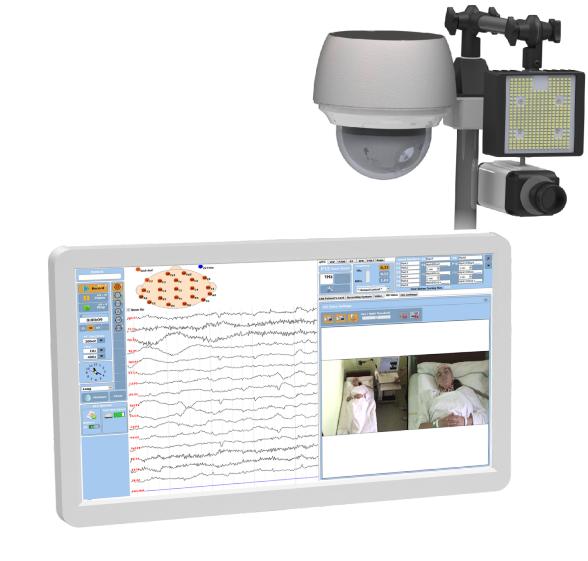 TruScan Acquisition was designed specifically for recording of the EEG, including a full-screen and minimized impedance panel that is visible at all times. Event markers and patient notes can be entered during the exam, as well as a separate panel for look-back functionality, to see and annotate previously recorded signal. All recording parameters can be quickly changed at the click of a mouse from the main screen, without needing to open additional setting screens. 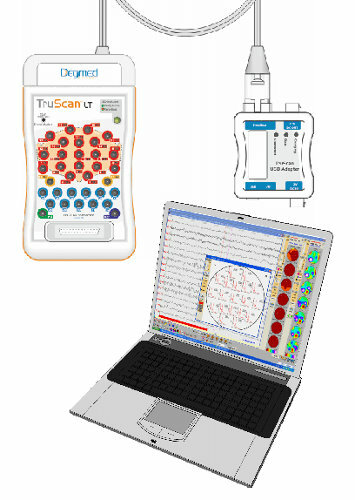 TruScan Explorer is a full EEG review software package with numerous tools and features that allow for quick and efficient review of routine and long-term EEG. All functions can be controlled by mouse or now with the new dedicated Explorer keyboard, you can navigate and review even faster, by utilizing the large scroll wheels and pre-set buttons. Brain mapping and spectral analysis is included, as well as export of data for review in other packages. The large, 22-inch Full-HD display offers a detailed view of the recording and all the software features. Of course, it is possible to adjust the height of the monitor and the possibility of turning it in two axes for comfortable operation of the device. There are also larger 24 "and 27" monitors available. High-quality patient reports can be generated with the included black&white laser printer. Options include wireless version allowing printer to be located away from medical cart. Medical grade built-in Isolation Transformer that meets the highest medical safety standards. On/off switch with LED indicators for status. Non-patient Grounding plug included on side. The Deymed integrated computer is optimized for use in healthcare. It is safely stored on a mobile construction that ensures easy mobility. It uses reliable and certified components with optimized power consumption, ensuring high reliability, durability and low power consumption. The computer is stored in an all-metal construction and is equipped with passive cooling of the processor. Thanks to the absence of a cooling fan, the system runs virtually silent, allowing the exam room to be undisturbed. Another advantage of the silent computer is the lack of dust and dirt intake into the computer, due to the sealed case. This protects the computer components which are left uncontaminated and therefore last much longer. Isolated network connection on back of cart allows a network cable to be safely connected while maintaining the required 5kV electrical isolation for patient safety. Network connection is up to gigabit speed for fast transfer of patient video and data to a central server. HL7 connections available with tight integration to TruScan software without the need to open a secondary program with worklist or patient directory. Custom HL7 mappings possible due to use of translation engine. 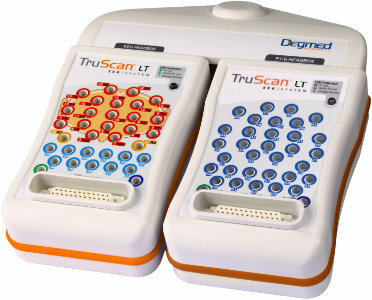 Includes FlexiCart with integrated computer and photostim, with 24ch, 32ch or 2x32ch EEG headboxes connected to a USB adapter and two HD camera's and infra-red lamp. 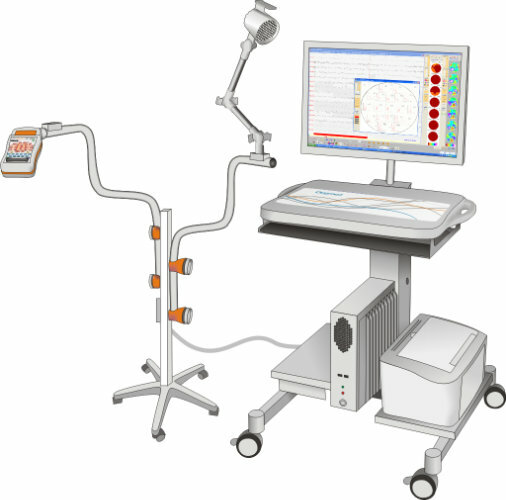 Includes computer with FlexiTrolley, Satellite Trolley with photo-stim, 24ch, 32ch or 2x32ch EEG headboxes connected to a USB adapter. 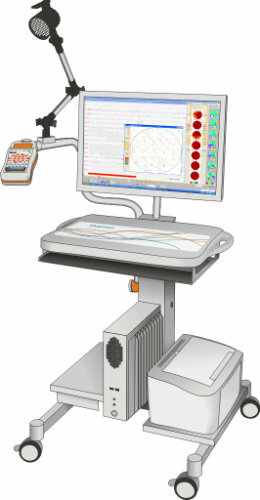 Includes FlexiCart with silent computer and photo-stim, with 24ch, 32ch or 2x32ch EEG headboxes connected to a USB adapter. Includes laptop with 24ch, 32ch or 2x32ch EEG headboxes connected to the USB adapter. 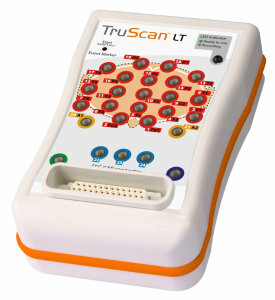 The TruScan LT Wireless EEG system can be used for Ambulatory, Wireless, Long Term Monitoring and standard clinical use. Connected or Ambulatory Mode: In Connected or Ambulatory mode, the TruScan LT system can record up to 60 hours on a single charge. Wireless Mode: In Wireless mode, the TruScan LT system can record for up to 34 hours on a single charge. The TruScan LT has a wireless range of 100 meters from the base system. With additional wireless signal extenders this range can be extended to 300+ meters. 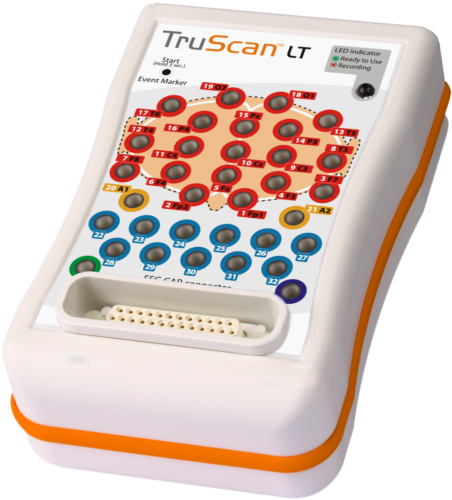 When a patient is out of wireless range, the TruScan LT will continue to record to internal memory and will automatically re-sync the backup data when the patient comes back into the wireless communication range. The compact TruScan RS Wireless EEG system can be used for Ambulatory, Wireless and Long Term Monitoring uses. 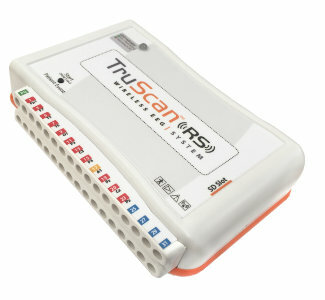 Connected or Ambulatory Mode: In Connected or Ambulatory mode, the TruScan RS system can record up to 96 hours on a single charge. Wireless Mode: In Wireless mode, the TruScan RS system can record for up to 45 hours on a single charge. The TruScan RS has a wireless range of 100 meters from the base system. With additional wireless signal extenders this range can be extended to 300+ meters. When a patient is out of wireless range, the TruScan RS will continue to record to internal memory and will automatically re-sync the backup data when the patient comes back into the wireless communication range.